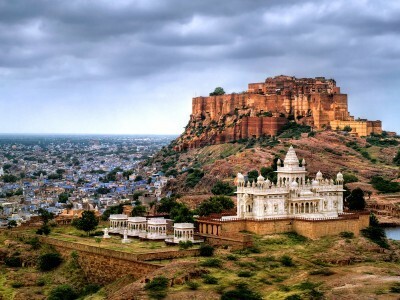 Jodhpur is the second largest city in the Indian state of Rajasthan. It was formerly the seat of a princely state of the same name, the capital of the kingdom known as Marwar. Jodhpur is a popular tourist destination, featuring many palaces, forts and temples, set in the stark landscape of the Thar desert. The city is known as the Sun City for the bright, sunny weather it enjoys all year. It is also referred to as the Blue City due to the blue-painted houses around the Mehrangarh Fort. Jodhpur lies near the geographic center of Rajasthan state, which makes it a convenient base for travel in a region much frequented by tourists. The old city of Jodhpur is surrounded by a thick stone wall. Jodhpur is an historic city and the origin dates to the year 1459 AD when it was founded by Rao Jodha, the Rajput chieftan of the Rathores. The Rathore kingdom was also known as the Marwar and was the largest in Rajputana. 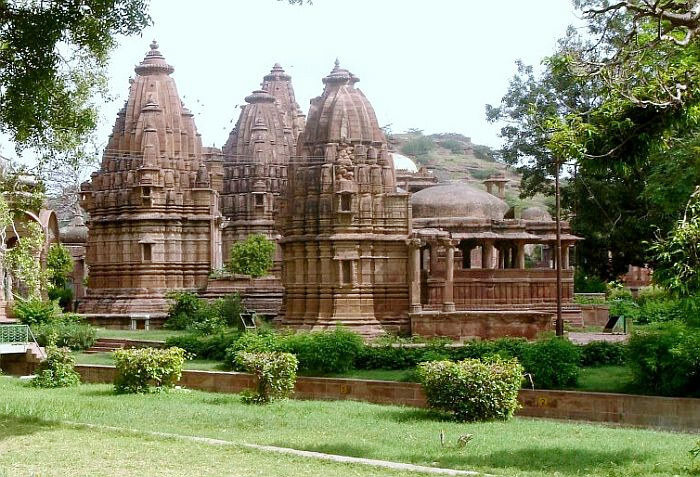 The city was built as the new capital of the state of Marwar to replace the ancient capital Mandore, the ruins of which can be seen near what is now the Mandore Gardens. 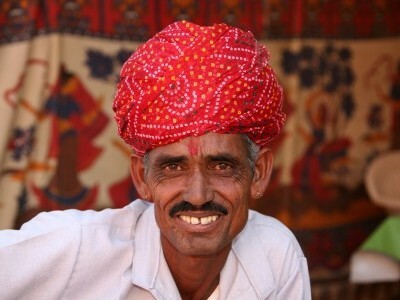 The people of Jodhpur and surrounding areas are hence also commonly called as Marwari’s. 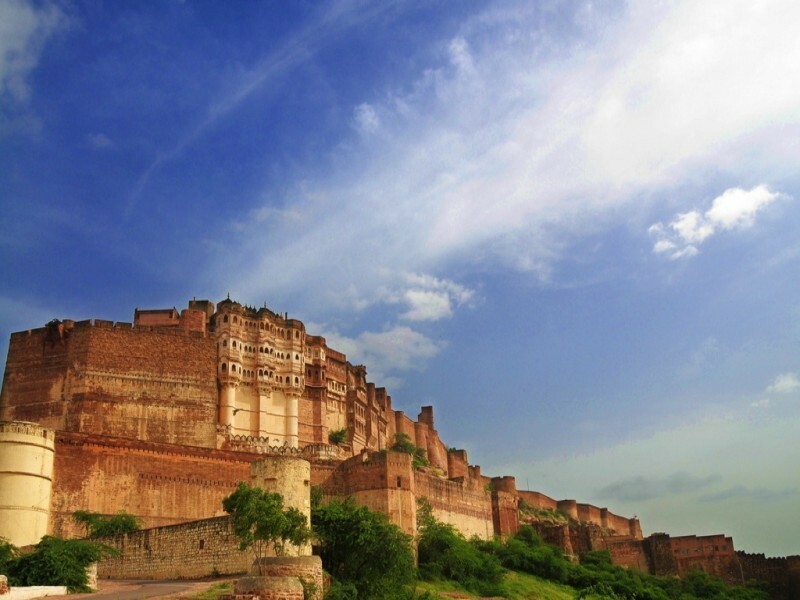 Dominates the city and is the largest fort in all of Rajasthan. 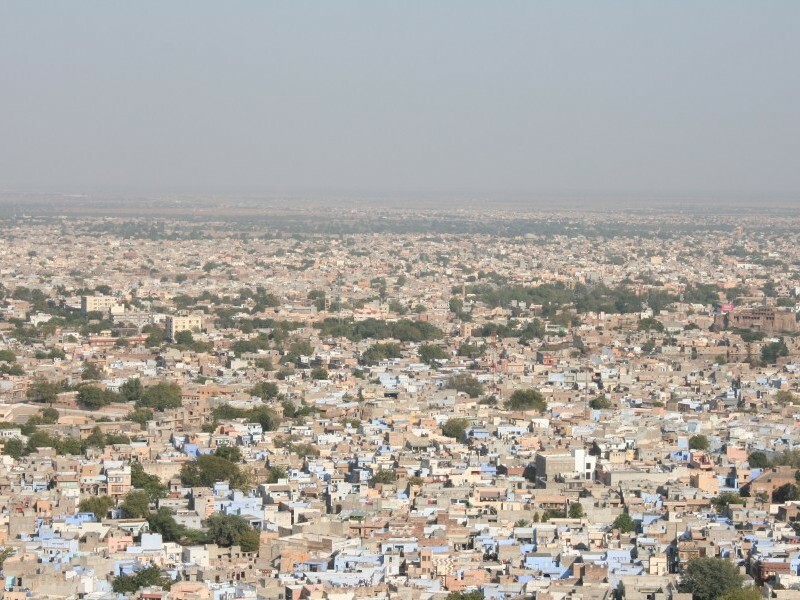 Founded in 1458 as the site of Rao Jodha's new capital — hence the name, Jodhpur — the city has grown around it and in the 500 years that have passed the fort has never been taken by force. It's easy to see why: it occupies the entire top of a 150-meter hill with commanding views all around, with some three kilometers of massive ramparts built around the edges. The name "fort" belies the size of the complex, which houses the Maharaja's palace, several temples and, tucked away in the back, an extensive garden still farmed to this day. 1 km downhill from Meherangarh (easily walked). Royal cenotaphs built in marble, with a picturesque location next to a little lake. Entry Rs. 20, plus Rs. 25 for a camera. Mandore, 7 km outside the city. The ancient capital of Marwar, before Jodhpur was built. Clearly visible to the south of the city and completed only in 1944, this is the last great palace built in India. The Maharaja of Jodhpur lives here to this day, but half the building has been converted to a 5-star hotel (see Sleep) and there is also a small museum on grounds (Rs. 50, open 9 AM to 5 PM). You'll have to take a rickshaw to get here, and it's best to ask them to wait: figure on Rs. 100 for a round-trip with an hour's waiting time. The Mehrangarh Museum Trust has recently teamed up with a British adventure tourism company called Flying Fox to provide zip line tours of the Chokelao Garden and Rao Jodha Park sections of Mehrangarh. The 'zip tour', a guided tour of the Fort with spectacular views of its western flank as well as of Brahmpuri - the bluest part of the Blue City - is an unique, exhilarating and safe way to learn about the culture and history of Jodhpur and Mehrangarh. The Rao Jodhpa Park is an area of special environmental interest, having been recently replanted with purely indigenous Marwari species and being home to magnificent fauna such as monitor lizards and Eurasian eagle owls. Zip tours cost between Rs 330 and Rs 1330. Tucked away at the far end of the battlements, this temple is devoted to Rao Jodha's favorite goddess and remains a local favorite to this day. Located 85 kms. From the main city. Situated in a rural setting, the 400-year-old, Fort Khejarla offers guests an enlivening experience. The stunning red sandstone monument is a mesmerizing example of the architecture of the Rajput’s. The rugged exterior contradicts an inner paradise with a striking blend of art and architecture leaving one with a magnificent aura! The spellbound grandeur of the Fort offers picturesque settings, latticework friezes, and intricate Jharokas that at once transports you back in time to experience the majesty of a long-gone era of valour and chivalry. To reach Khejarla from Jodhpur, head on Jodhpur Jaipur highway for 73 Kms. You'll cross Bhavi village and a railway crossing. After railway crossing go 3.5 kms and take a left turn. Then go straight for 12 kms and you'll find Khejarla fort. 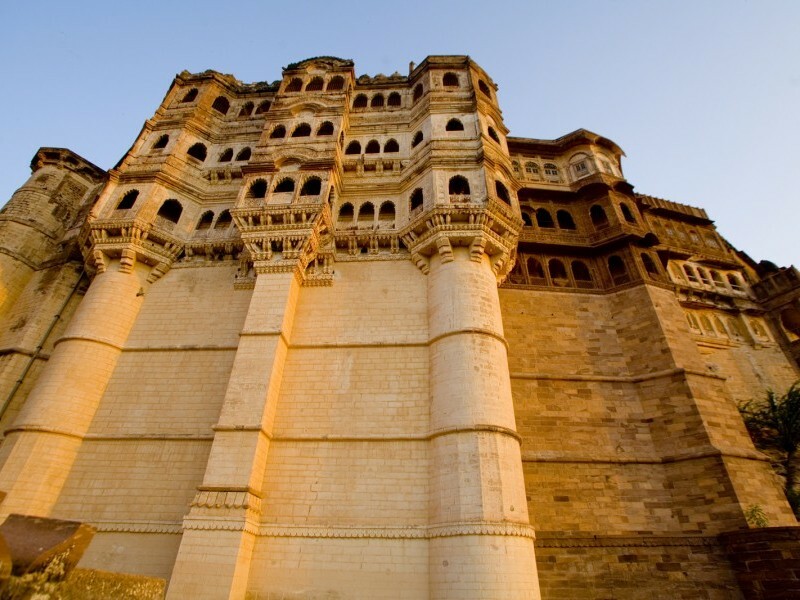 International music festival held annually during October at Mehrangarh Fort. 250 Kms far from Jodhpur, Udaipur is referred to as the "Venice of the East", the "Most Romantic City of India" and the "Kashmir of Rajasthan" (a reference to Dal Lake) and not without reason. Located 280 Kms from Jodhpur, Jaisalmer also known as "Golden City", is located on the westernmost frontier of India in the state of Rajasthan. Close to the border with Pakistan, the city is known for its proximity to the Thar Desert. Desert Safari in the sand dunes of Jaisalmer is an unforgettable experience. 190Kms from Jodhpur, Pushkar is a holy town famous for its one and only Brahma temple in the world and Pushkar lake. Located 260Kms from Jodhpur, Bikaner is famous for desert safari and Bikaner Fort. Full / Half day Jeep Safaris through the desert visiting the lonely villages of the amazing bishnoi sect. a great opportunity to spot the abundant wildlife of the region. The safaris include lunch (traditional desert cuisine) and mineral water. About 60 km - Jain temples as well as Kali temples. Let one of our tailor-made holiday experts help you plan a personalised Jodhpur experience as per your budget and requirements.